When Hands-On Cuisine was only a thought in my head, I never imagined it to be solely a repository for my own recipes; I wanted to include my own culinary thoughts and musings as a reflection upon cooking in a modern household. A lot can happen in one year, and culinary discoveries can be made! I like to experiment with different and unfamiliar processes, and over the past few months I have taken up the mysterious art of bread baking. I was captivated by how four of the most simple ingredients, flour, salt, water, and yeast, can elicit such a wide variety of results while carrying such stigma for being difficult and time consuming. Bread has been the staple food of the western diet for thousands of years, and I find it amazing that a skill so integral to even our most recent ancestors has been nearly totally lost in the last 50 to 100 years. What happened? I, not unlike the proverbial cat, had to have my curiosity resolved; I had a whole modern kitchen at my disposal,which is certainly more than medieval Europeans had, this couldn't be that hard. Since my curiosity was piqued I did what now comes naturally to me; I hit up the internet and was speedily overcome with a sense of information overload. It seemed like there was so much information, yet so little actual content. I'm sure you know the feeling, hell, it might even be what brought you here. It seems the world of bread baking is filled with people who all have THE ABSOLUTE BEST RECIPE IN THE UNIVERSE AND THEN SOME!!! !, and as we all know if you set astronomical expectations you best be prepared for disappointment. So in an effort to help you save some time and frustration I want to give out some pointers to the burgeoning baker as the kickoff to a somewhat periodical series on bread. If you are really interested in trying your hand a bread baking I would suggest picking up a good book on baking, many of which also include sections on cookies, cakes, and a wide variety of delicious confections. I find a good book clearly teaches the fundamentals of baking and will usually provide extremely helpful illustrations from master artisans. While I have bought and tried out a few different books, one that I have absolutely fallen in love with is Buchon Bakery by Thomas Keller and Sebastien Rouxel (2012). The book was a gift from my wife and has been absolutely wonderful. I find Keller and Rouxel's approach to be straightforward with a rich and experienced presentation. 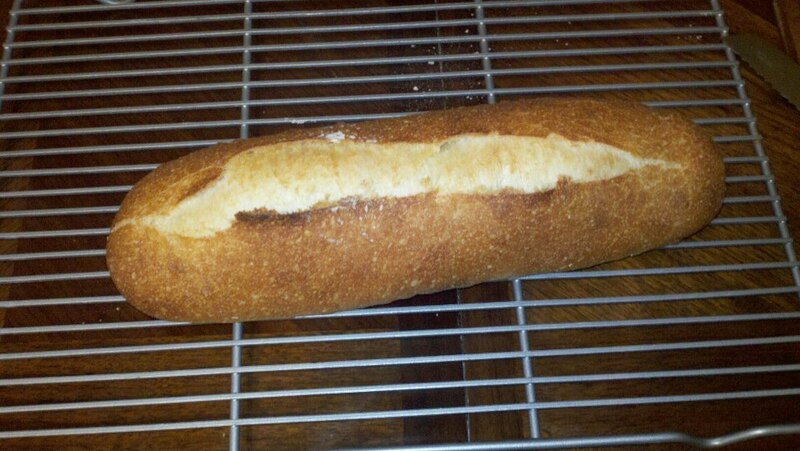 The bread baking segment is geared for the home-cook and I found it easy to jump right in. They even note that every recipe has been ideally scaled for preparation using a KitchenAid stand mixer, which is extremely convenient. They also provide all measurements in grams, which ensures that the recipes are reproduced exactly and consistently; baking does require you to be a bit more exact in your measurements after all. This book has helped me to understand the chemistry behind bread baking and acted as an outstanding introduction. This was exactly what I was looking for. The intent of this post was not a book review, but as an introduction to a world I have recently discovered and found to be quite delicious; a way to get your hands doughy if you will. Gone are the days of overpriced baguettes in our house, but here to stay are fresh bread bowls for soups and warm bread straight from the oven! So with that in mind keep your eyes peeled for some exciting new entries on bread. A French batard prepared following Buchon Bakery's instructions.